Governor Jan. Brewer on June 19 signed House Bill 2551 (off-highway vehicles; use; authority; enforcement). The bill clarifies state authority in how it will enforce federal Travel Management Rules regarding off-highway vehicle use on U.S. Forest Service or Bureau of Land Management lands. The Arizona Game and Fish Commission voted in March to support HB 2551, but made its support contingent on adoption of amended language that would address the commission's concerns about unintended limitations on officers' ability to enforce resource damage laws or road closures for public safety purposes, such as during forest fires. Subsequent amendments addressed the commission's concerns. The legislation, sponsored by Sen. Chester Crandell (R-Heber) and Rep. David Gowan (R-Sierra Vista), passed the Arizona Senate and House in May. The bill permits Game and Fish officers to enforce laws related to habitat damage and other duties important to the department's mission, while giving officers discretion in enforcing federal travel management rules that are lower priority or that might impede achieving wildlife management objectives. 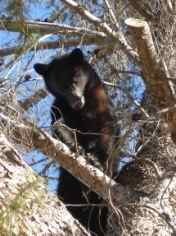 The Arizona Game and Fish Commission has expressed long-standing concerns that the new forest Travel Management Rules put undue constraints on reasonable public access, are inconsistent across the different forests and therefore confusing to outdoor recreationists, and could impede the commission's and department's ability to meet wildlife management objectives. In addition to the Arizona Game and Fish Commission, HB 2551 is supported by county sheriffs and county supervisors throughout Arizona. "One purpose of this legislation is to reaffirm the department's leading role in protecting wildlife habitat, while ensuring that the use of our law enforcement resources are not spent on efforts that, in some instances, unreasonably reduce the opportunities for Arizona's families to fish, hunt, camp or enjoy wildlife viewing or responsible off-highway vehicle recreation," said Kurt Davis, a member of the Arizona Game and Fish Commission. Davis said the department's education programs, scientific evaluation and law enforcement activities related to protecting wildlife habitat will continue, while balancing the ability for Arizonans to enjoy the outdoors. "This legislation simply strengthens the department's legally recognized role to manage wildlife across all our public lands and ensures that role is more appropriately recognized and respected," he said.